If you do not have a birding or purple martin website of your own, but you know of a quality purple martin or bird-related website that you would like to recommend, please let us know. If you are the owner or webmaster of a birding-related website and you would like to exchange a link in order to help drive traffic to your site, you can make use of our Link Exchange Program. All you have to do is add a link to http://www.mypurplemartinblog.com on your website, and then submit your website URL to us using this page. Your link will be reviewed and if it is approved, it will be added to this page. At least some content of your website must be related to purple martins or wildbirds. 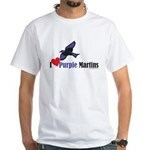 You must already have a link to http://www.PurpleMartins-R-Us.com/ somewhere on your website. Enter URL you wish to submit, and then enter the verification code.